Stepping through the front door into Jade and Darren’s hallway, it’s hard to believe their Victorian house is a first time buy. Since snapping it up five years ago, the couple have restored the property to its 19th century glory, using the weekend breaks from their busy jobs to embark on DIY projects and creative paint updates. 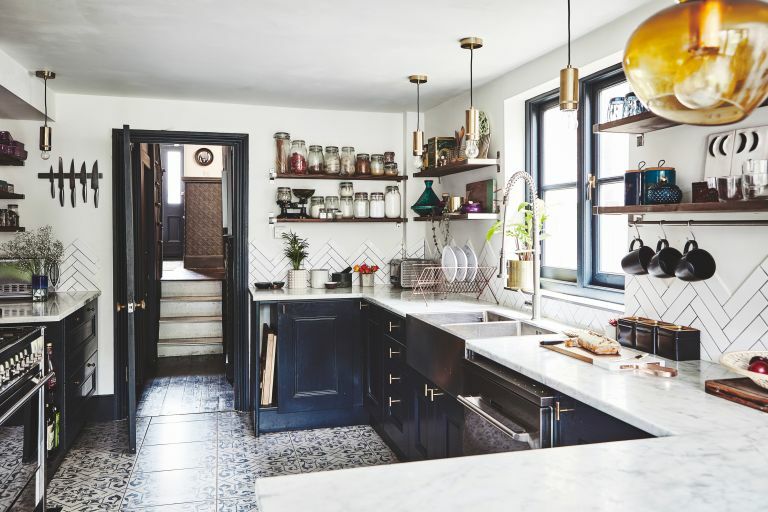 Read on for Jade's budget-friendly tips and tricks for updating a home on little money, then check out all our amazing real home transformations for more inspiration. Use our guide to renovating a house to get the best from your own project, too. 'We’d always wanted a period home, but it was a real push to buy this house in the first place. We were both in our 20s when we started looking to buy a house, and we wanted somewhere close to work to reduce the commute. The owners Jade Rodrigues, who works in asset management, lives here with her husband, Darren Wimhurst, an investment banker. The property A three-bedroom, ex-council Victorian terraced house in south-east London. Project cost £13,600 for the kitchen and bathroom renovation. 'We bought this house because of the high ceilings and chimney stacks. It has long, narrow proportions, but we like that. Everyone seems to want open-plan living now so families can be in one open space. 'My parents have that and I hated it growing up. Wherever you’re in the house, your parents can hear you – and if you had friends over, you were basically sitting in the room with your mum and dad! 'The renovation process was very gradual. We worked on the house as and when we could afford it. We both work full time, so it was a case of doing DIY at the weekend. 'I love cooking and wanted a space to have people over. The original kitchen was at the end of the room and the dining room was in here, too. I wanted to create a breakfast bar, but everyone told us the room was too small and that we’d have to have a galley kitchen. 'We stretched ourselves to the max to get the house in the first place. Once we’d moved in, all our monthly income was going on our home and we’d do jobs as and when. Some things were really tough. 'The kitchen was practically unusable, and we would have loved to pay a kitchen fitter but didn’t have the money. We ripped it out six months sooner than intended because our boiler gave up and we had to move it. 'We’re not DIY people and couldn’t do things like tiling, but we employed a carpenter on a day rate, which saved a lot of money. 'It was important to us to keep some of the Victorian character. They don’t make houses like they used to. I’m interested in the decorative aspects of Victorian houses in particular, and wanted to emphasise original features where I could. 'In the hallway, for example, we painted the stairs. We couldn’t afford a runner and I wanted to draw attention to the beautiful bannister spindles, so we painted the sides black for a cool effect that cost practically nothing. 'The carpentry and mouldings in the house are painted dark colours to accentuate them, and we had the panels and beading of the original Victorian doors replicated in the French doors the carpenter made for our kitchen. 'My favourite room in the house is our bedroom. It’s exactly what we wanted, bold and neutral colours in balance. We didn’t want to go too safe – the two-tone walls and painted ceiling make a statement.